Our love affair with The Fatty Bao is hardly a mystery. We had a hard time keeping our hands off their buns anyway, but now they’ve got us drooling with their ramen bowls too. They’ve got perfect, piping hot broth which has been simmered over eight hours in so many variants that has got us oh-so-excited! Rainy day? Weekday blues? The Fatty Bao Chasu Ramen will come to your rescue. It’s a perfect swirl of pork stork with bacon, braised pork belly, soft boiled egg and a generous heap of bean sprouts. Soothe yourself with this mouthwatering combination! Oh this makes us so, so hungry! 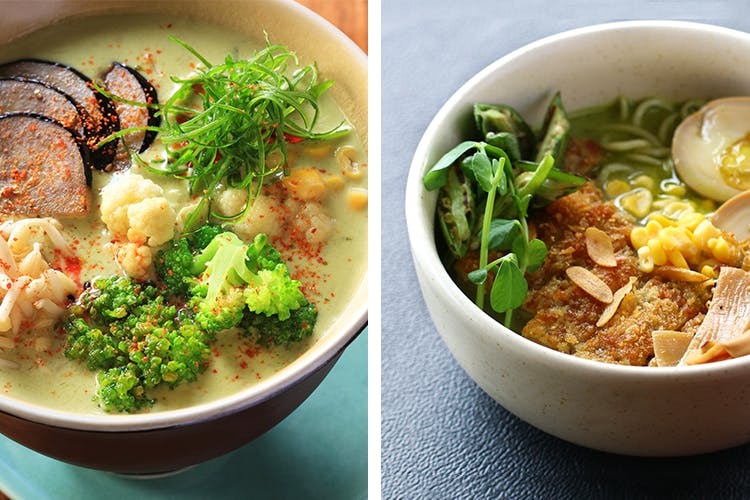 This ramen bowl is made with chicken broth, green curry and coconut milk, crusted chicken leg, okra and garnished with red chillies and garlic. It’s delicious, so you’re going to be completely hunched over the bowl, asking for more! It also comes in a vegetarian variant which is just as hunch-worthy. This signature dish is prepared in hearty chicken broth with smoked chicken, ginger, fried onions, scallions and black noodles. The Fatty Pho is going to bowl away all your troubles and quieten that growling stomach! The Fatty Bao has always been kind to vegetarians and is our haven for scrumptious vegetarian Asian food. They’ve stepped up their game with their exotic mushroom ramen bowl prepared with mushroom broth, broccoli, Renkan chips, assorted mushrooms, grilled scallion, garlic and topped with crispy onions & smoked sweet corn. Is your mouth watering too? Go grab your bowl now! Via Malaysia with its aromatic coconut broth infused with kaffir lime leaves, chilli, garlic, lemongrass, galangal and basil has got us swooning all day long! This is the bowl via which you taste ramen in all its glory and have you slurping till the end! Started drooling mid-way? This has got to be the way ramen has to be cooked. With vegetables, chicken and meat variants – you won’t be able to get enough their flavourful offerings and generous portion sizes. Follow The Fatty Bao for more delicious food updates on Facebook, Twitter & Instagram. Drop By At This Place For The Best Ramen In Town!